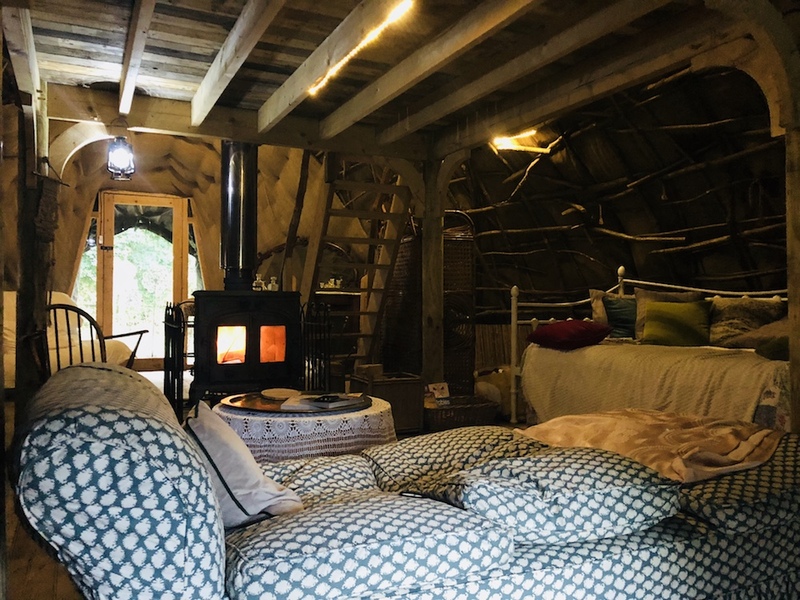 Grab a cuppa, snuggle up under a blanket on the sofa and start planning some Norfolk staycations for 2019. January is all about recuperating in the Muddy household but it doesn’t take long for my feet to get itchy, my notepad to come out and for the list building to commence. Number one is always finding cool places to stay within an hours car journey of home. 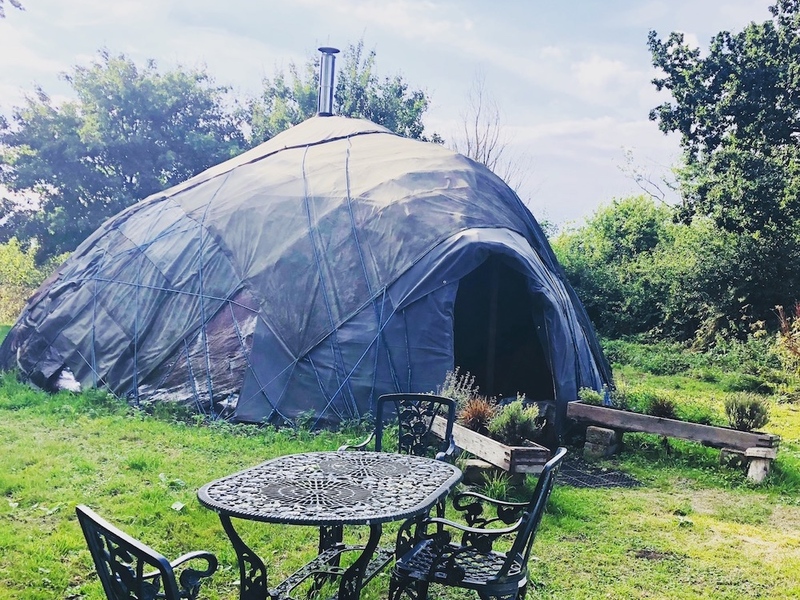 This isn’t because I’m afraid to step over the border – although with amazing eats and sleeps popping up all over Norfolk we may never have to leave! Truthfully, I am a bit lazy and as a busy working mum I want to maximise time away and would rather not spend those precious minutes on the motorway. So here we go with the first in my series of cool Norfolk Staycations. Do feel free to get in touch or comment below if you have any recommendations that you’d like us to check out. We’re on a Muddy mission to bring you the best of the best in Norfolk. This beautiful one level holiday property is tucked just behind the dunes at Waxham beach. As you approach this modern building along the raised wooden walkway my first thought is that the design is purposefully simple so it fits in discreetly with the surroundings. Once inside, you instantly get a sense of the design and build quality. 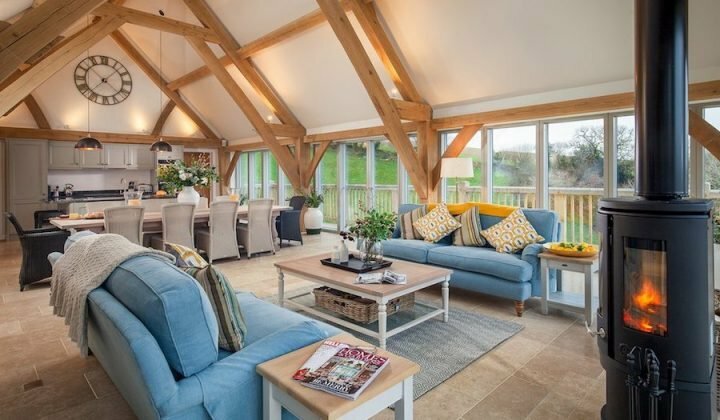 From the bespoke kitchen and textured wooden wall to the bi-fold doors in the lounge and bedrooms to the the rain sensor windows – this place is high spec comfort all the way. 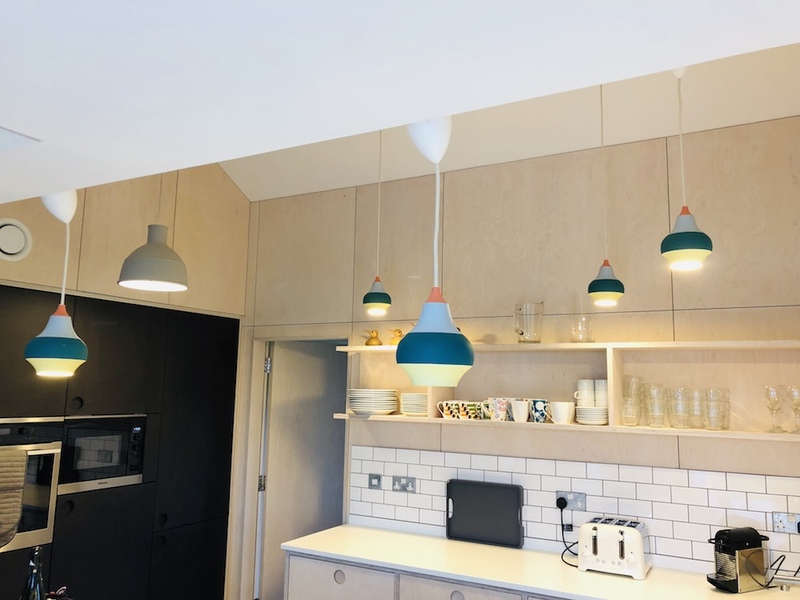 There’s a very Scandi feel to the design which I love – simple plywood walls and ceiling contrast with clever and subtle design themes linking the colours and materials. 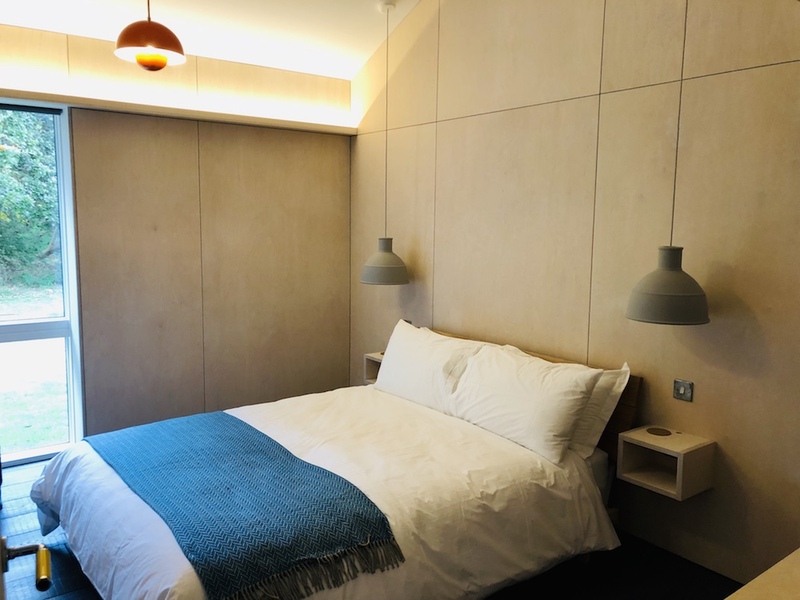 The blankets, cushions and lighting are all very Hygge and show that real thought has been taken to create a comfortable and liveable environment. The property sleeps seven in two en suite doubles, one twin and a very cute kid’s den with bespoke cabin bed. 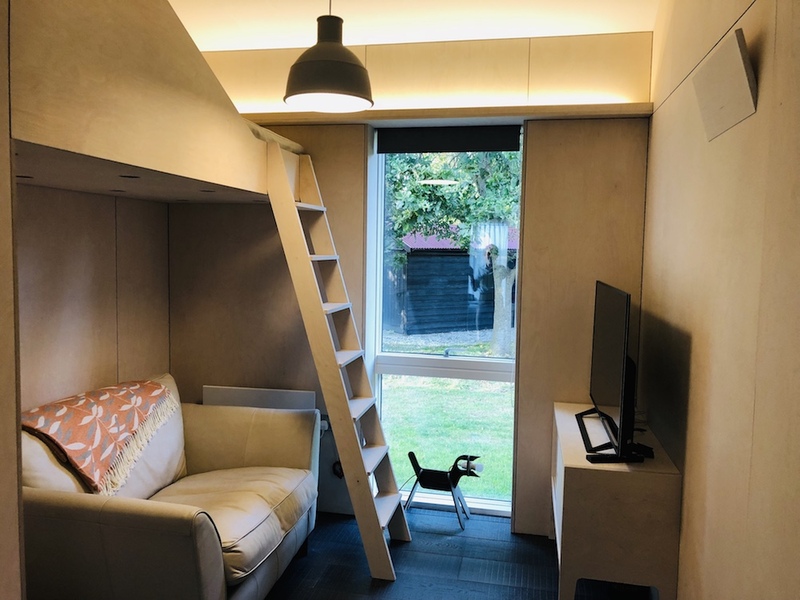 It’s dog friendly but I’d err on the side of caution and only take a very well behaved pooch who doesn’t jump all over the furniture (sorry Fletcher, you’re out). 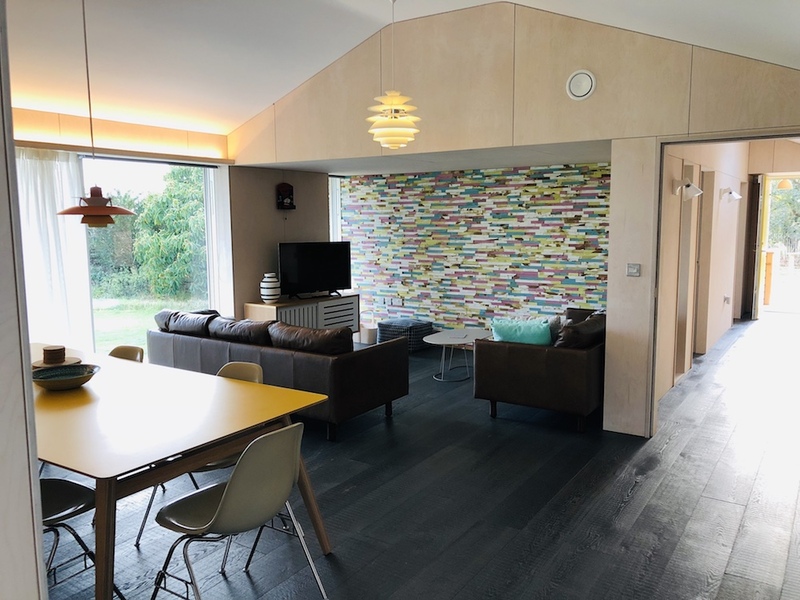 Waxham Beach is much quieter than the North Norfolk coast and in the winter months you’ll experience the wild desolate feel of the surroundings which make it the perfect bolthole. A good walk along the beach to Horsey Gap will warm your cockles and your heart as you’ll see hundreds of grey seal pups from November to March. In the summer, the house opens up to a large decking area and mature garden with endless views of fields and dunes. Great for families and groups of friends who want to escape the hustle and bustle of city life. Enjoy fun on the beach during the day and there are two sea kayaks for anyone feeling adventurous. As the sun dips, retire to the house for a BBQ and marshmallows around the fire pit – sounds idyllic right? 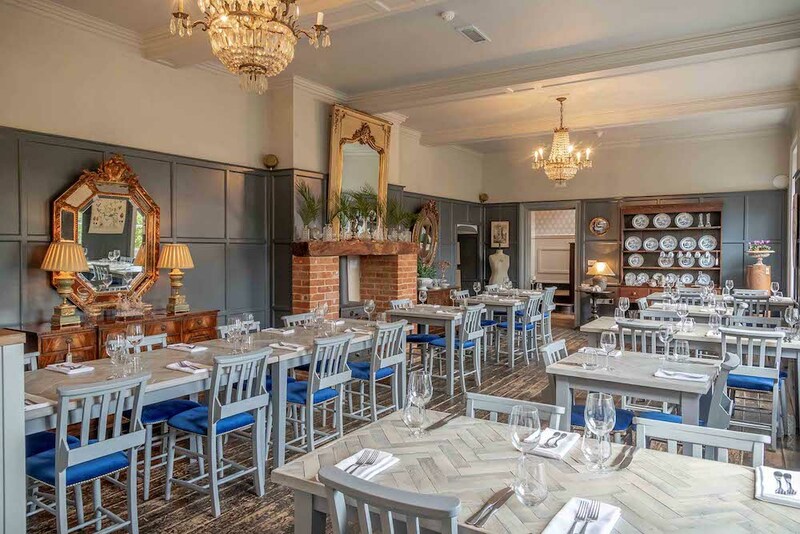 Gastro dining – The Ingham Swan which re-opens this year – check online for date. The owners have thought of everything to make this a great beach stay. Plus it was the best welcome basket I’ve ever seen – bursting with local goodies. You really don’t need to leave the house! 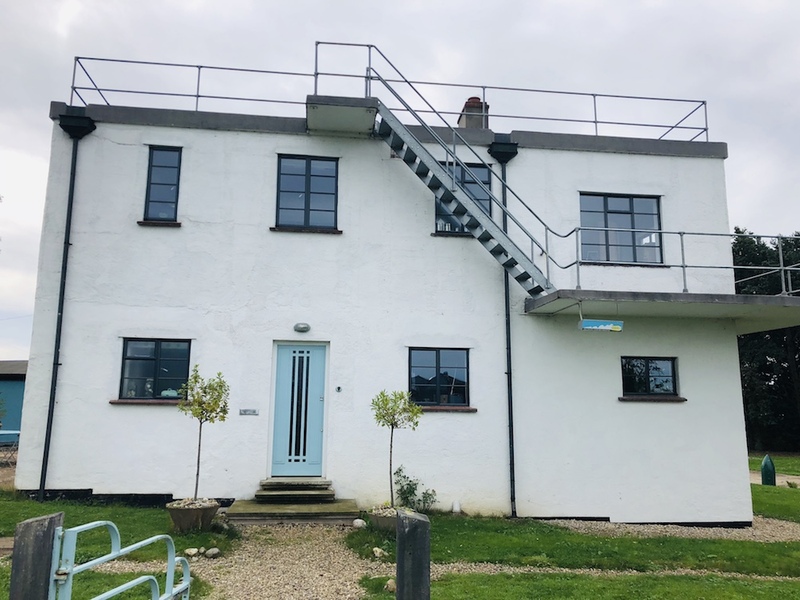 This WWII Control Tower perched on the edge of former RAF North Creake has been lovingly restored by Art Deco enthusiasts Claire and Nigel and transformed into a unique vegetarian Bed & Breakfast. It’s such an unusual proposition that when you arrive you’re instantly intrigued by the history behind the tower and the surrounding area. Step inside and back to the 1940’s, which might not be everyone’s cup of tea but if you love vintage this is definitely the place to come. It feels a little like a cross between your Nana’s house and a museum with lots of fab retro art and memorabilia. Plus if you fancy learning more – there’s a free tour of the tower every morning. Now I’m not going to lie – I’m not really a WWII enthusiast but I found Nigel’s talk fascinating. 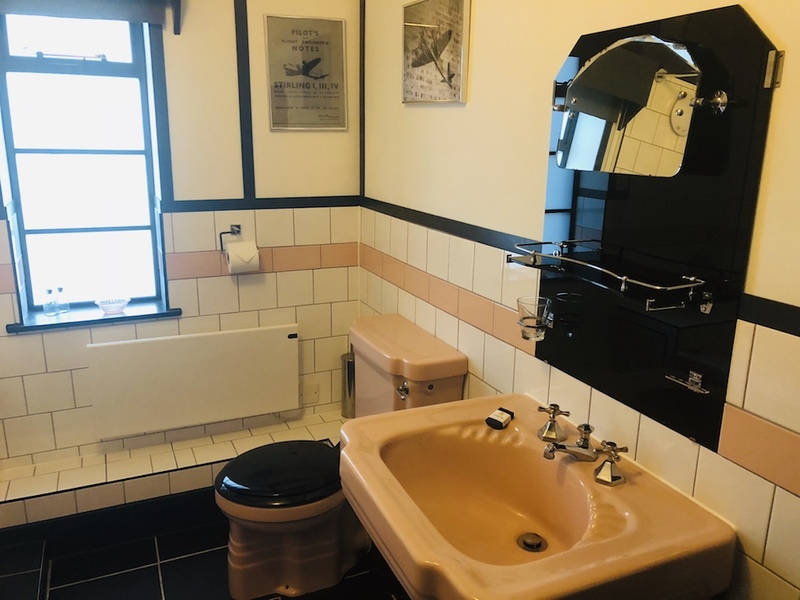 We stayed in the Stirling Room – the garden annex double with an incredibly cool pink and black en suite art deco bathroom. There was a small living area which opened onto a large garden. 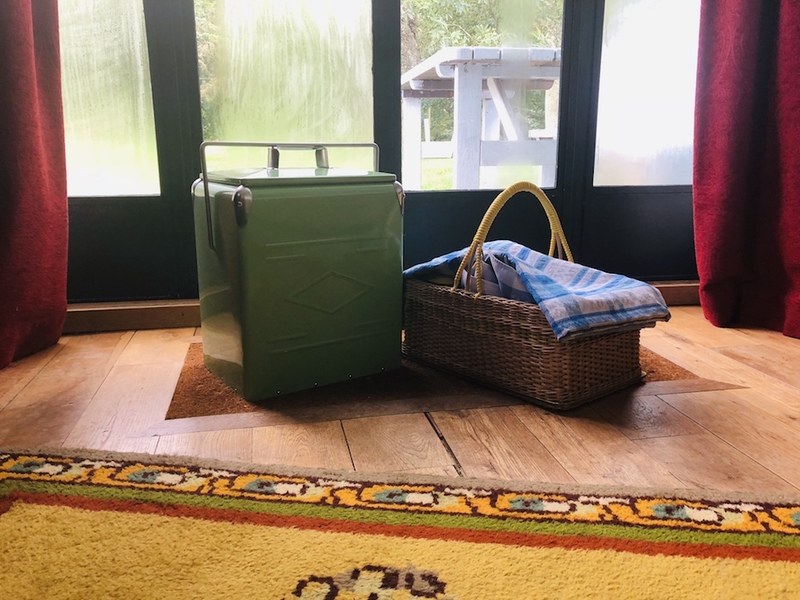 Breakfast is delivered to your room by Nigel and the attention to detail with the furniture, crockery, baskets and coolbox is so darn cute! And talking of cute – Nigel & Claire’s personal vintage style is amazing and left me wondering how they have time run such a busy establishment and look so dapper! Only a few miles from the seaside town of Wells-next-the-sea, Holkham Estate and the beach. 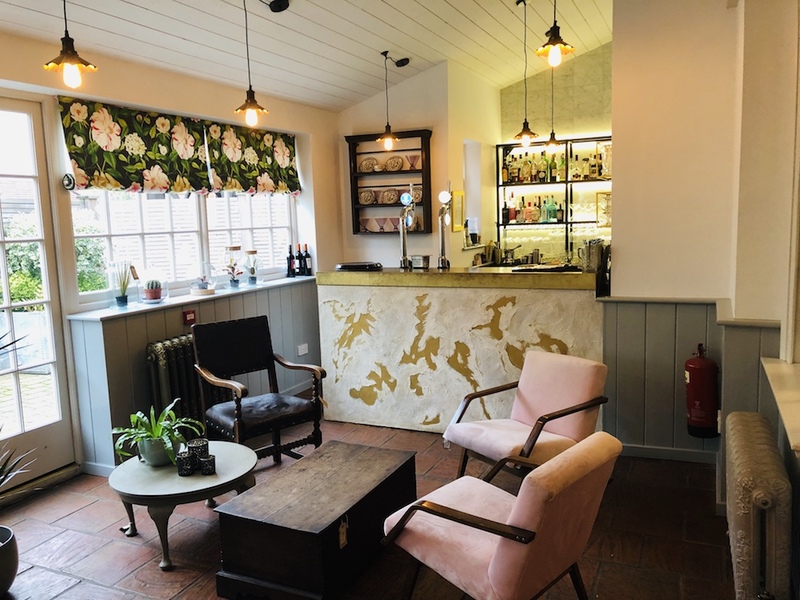 Some lovely eateries dotted around the area – The Red Lion in Stiffkey, The Jolly Sailors and White Horse in Brancaster and Socius in Burnham Market. 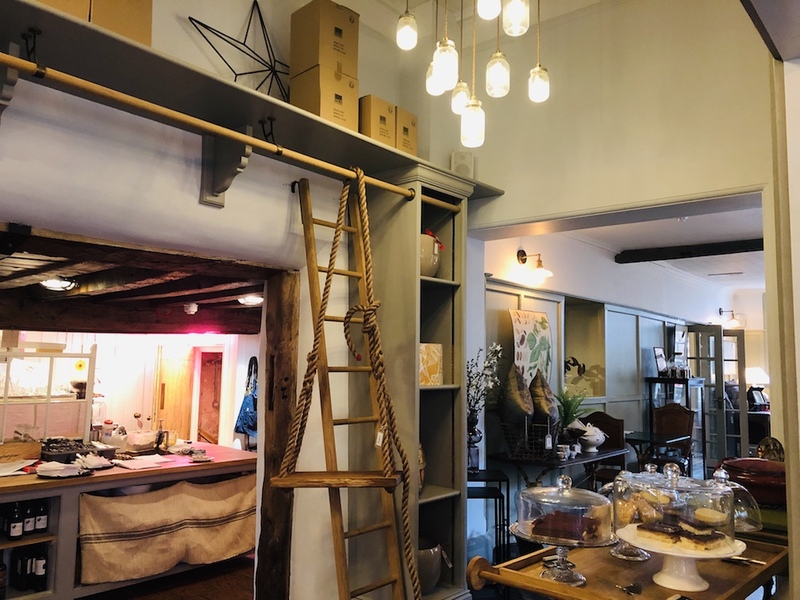 You’re also spoilt for choice with local art and craft – Deepdale Market is a great place to visit and if you want nice boutiques, carry on to Burnham Market. Hidden away in the village of West Lexham in the heart of the Norfolk countryside, this place is so secret even the locals don’t know it’s there – trust me I asked one for directions! 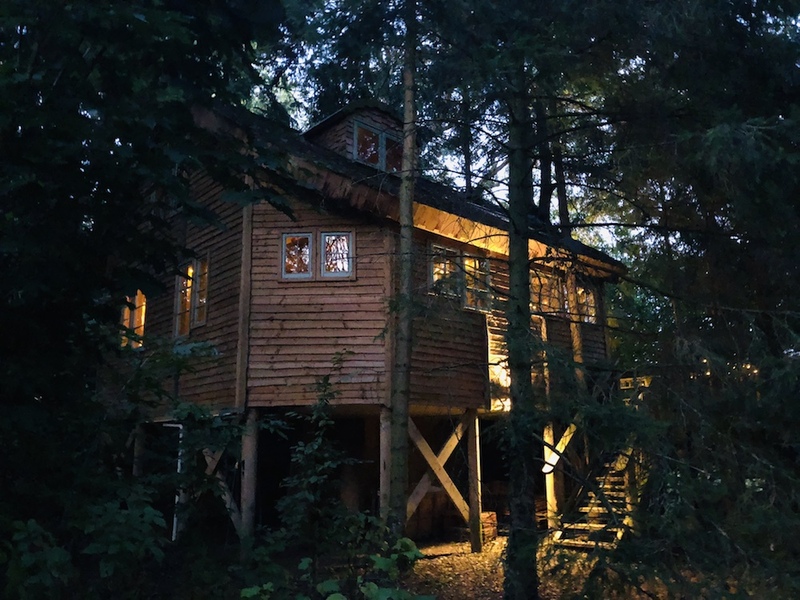 We were all beyond excited to sleep in a real treehouse and even the grown-ups regressed as we excitedly ran around the two stories gasping at the trees as they climbed through each of the bedrooms and even the dining room table. The craftsmanship was beautiful and the decor simple – think hippie chic meets Little House on the Prairie. I loved the willow staircase to the mezzanine, the stained glass windows and the large balcony overlooking fields and rivers. In the morning I understood why this tree house was named Sunrise. 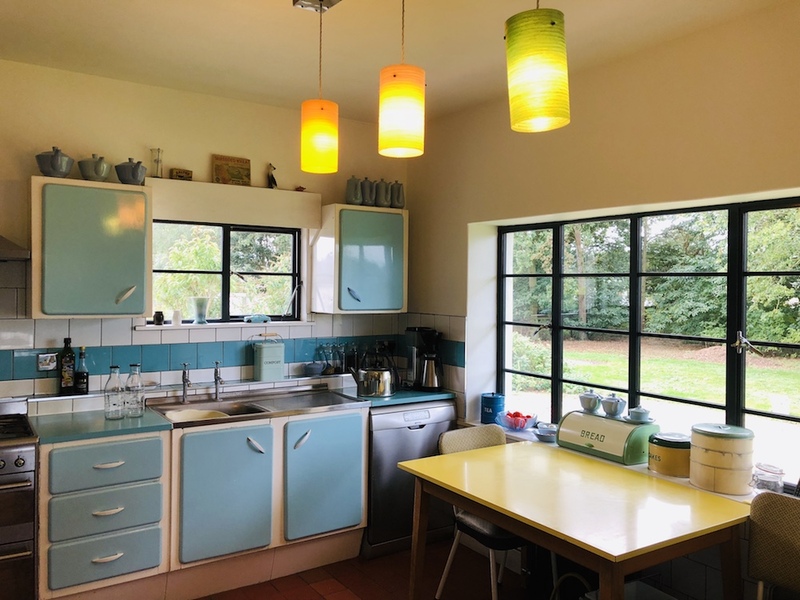 Don’t fear – all the essential mod cons are present; fridge, kettle, small hob, microwave, crockery, wood burner and heating. 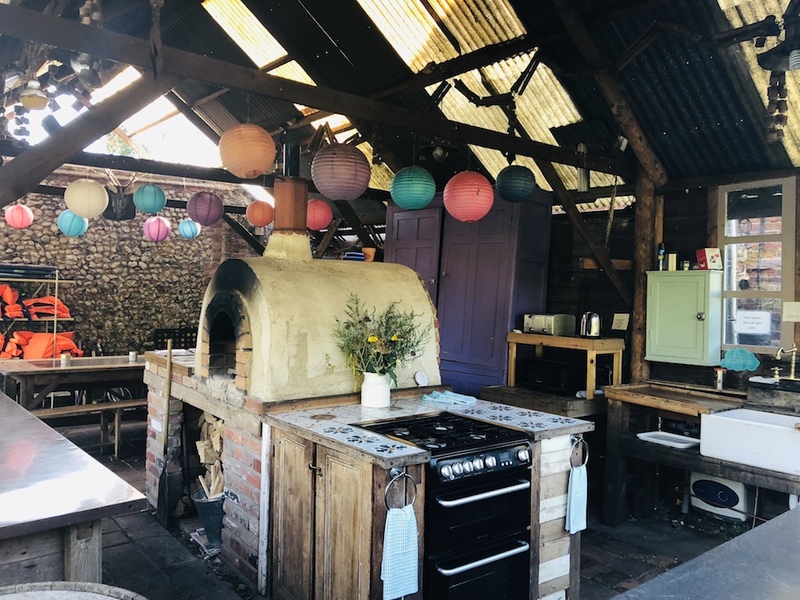 Plus if you’re feeling the communal vibe, you can head over to the shared outdoor kitchen with it’s pizza oven and fire-pit. 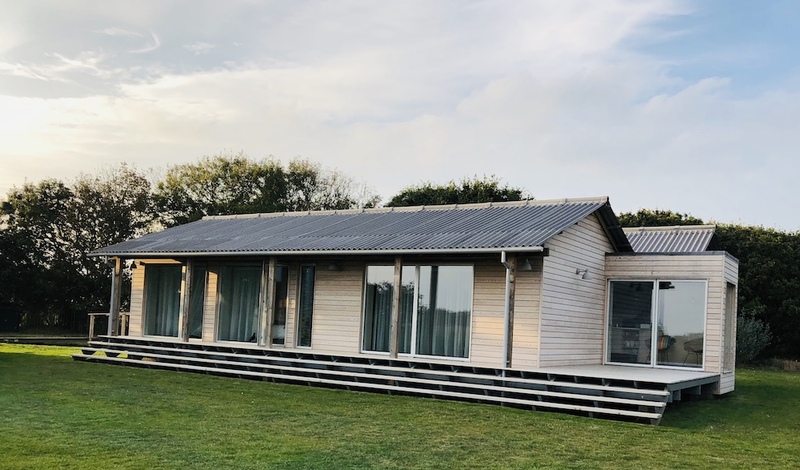 The toilet and shower block are worthy of note – the best I’ve seen on a glampsite and definitely boutique hotel standard. There’s even a bathtub – a sigh of relief if you’ve ever taken babies or small tots camping and struggled getting them in a shower. I personally can’t get enough of twinkly lights – throw in some path lanterns and I’m beginning to think there might actually be fairies at the bottom of this Manor House garden. 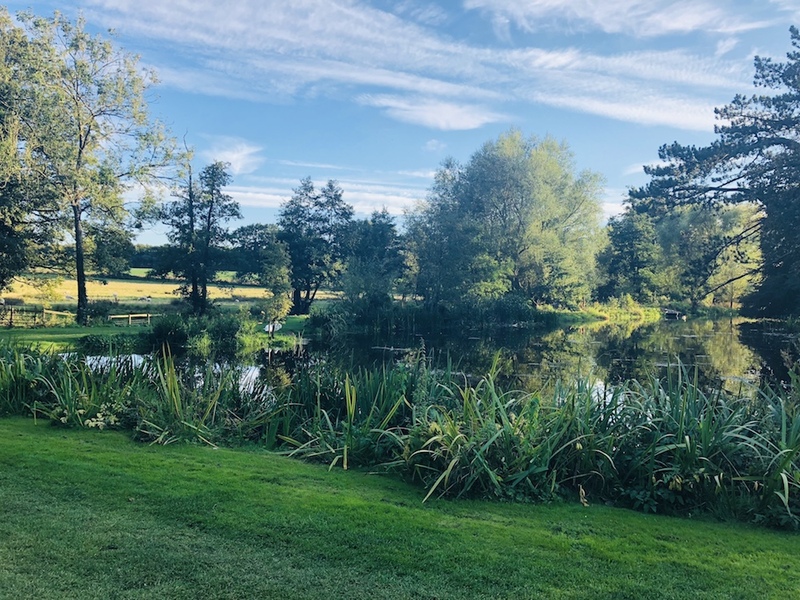 Set in 21 acres behind the Manor House, the estate is an eco-friendly paradise, run on over 90% renewable energy and full of wildlife just waiting to be explored – tree hugging is encouraged. Fields, woods, river, tennis courts, boating lake (life jackets provided) – nowhere is off limits. This is an incredibly peaceful place to unplug and get back to nature. 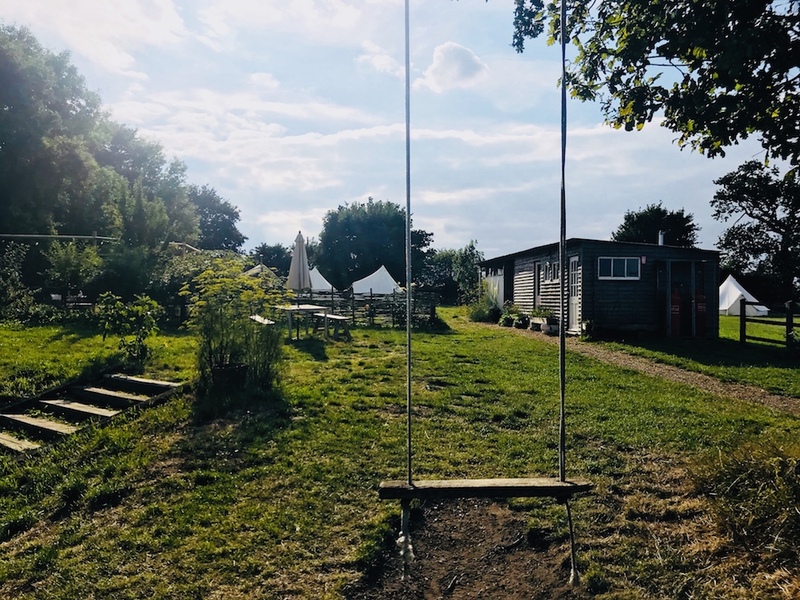 It couldn’t get much more idyllic – imagine happy dirty kids, marshmallows round the fire pit in the evening and snuggling up by the wood burner with a glass of wine and a good book. Are you there yet? If you feel the need to leave, you’re not far from Castle Acre Priory which is a great place to explore and the Ostrich Inn for good food. Houghton Hall and Oxburgh Hall are not far if you fancy a bit of National Trust style action. Plus you’re just off the main road up to North Norfolk and all the lovely seaside stuff in Old Hunstanton, Brancaster and Wells-next-the-Sea . 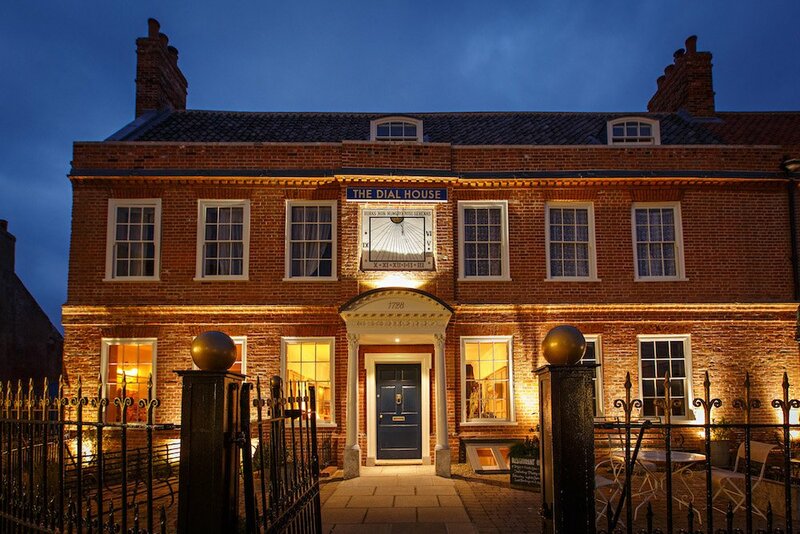 This award winning guest house in the pretty little market town of Reepham certainly lived up to it’s reputation. 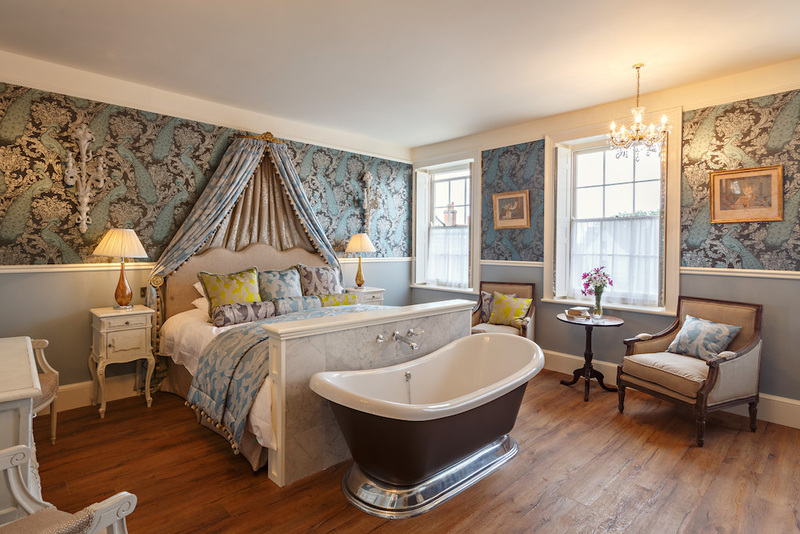 The Dial House has eight individually styled bedrooms that tell the tale of Georgian discoveries from around the Globe. My sleep buddy for the night was The Mindful Cook aka Josie Buck and we stayed in the fabulously sumptuous Italian room. Tastefully elegant with beautiful art deco furnishings, the owners really have thought of everything. 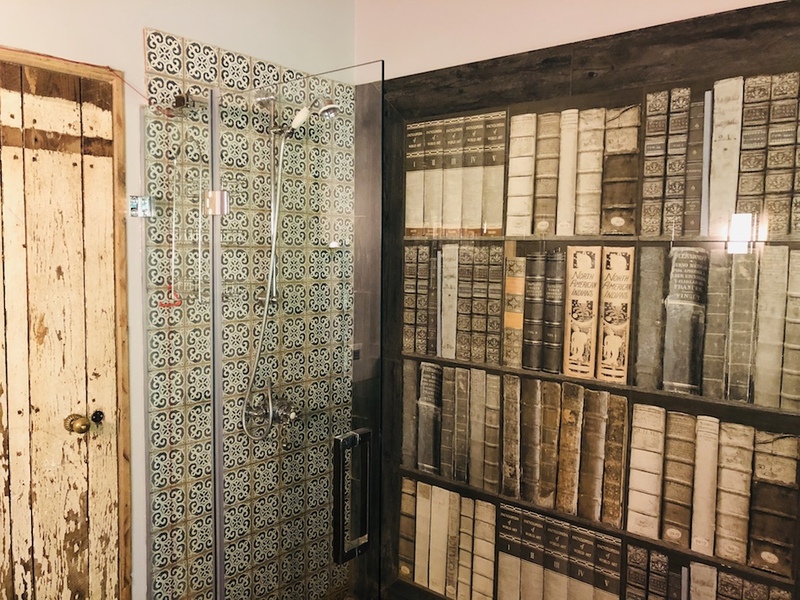 From the Grand Tour Travel Journal guiding you around the property to your very own record player – it made for a luxurious and slightly quirky stay. 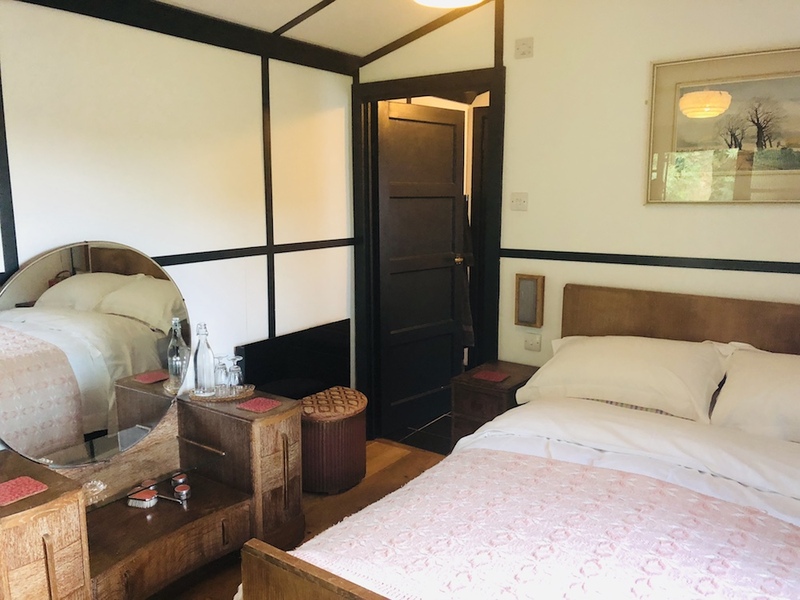 Let’s tick off a few of my Muddy Musts – great linen and pillows, fluffy robe, a good selection of quality tea and coffee and nice toiletries (White Stuff). I’m a sucker for surprises and there were smiles all round when we were told about the complimentary night cap and cream tea! 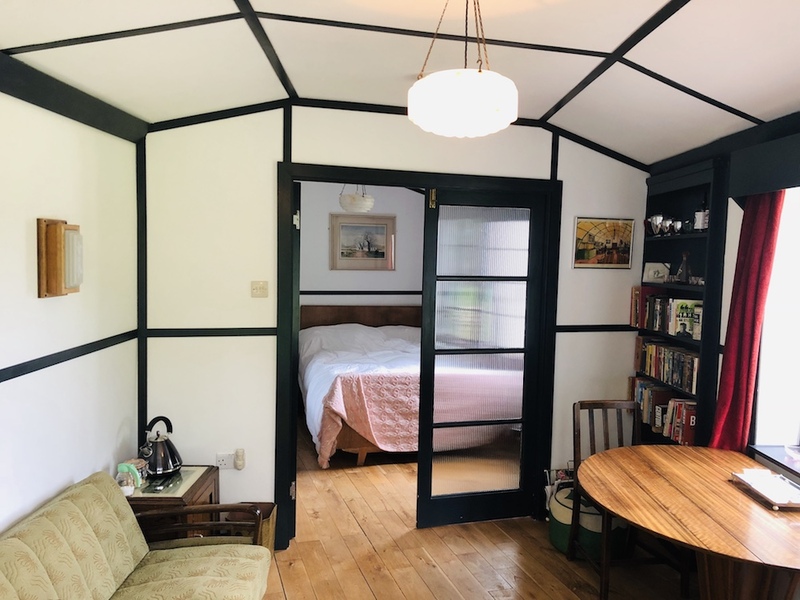 I love the Imperial feel to this Georgian guest house – as you move between rooms, the incredibly well designed environment takes you on a journey through different times and landscapes. I’m not kidding when I say you could easily fill a weekend meandering and marvelling at all the wonderful curiosities that fill this place. The best bit? You can buy them too! From period furniture and exquisite glassware to retro accessories, everything you see in each of the cosy dining areas is for sale. As we sat eating our evening meal we had great fun chatting and theorising about some of the objets usage. If you’re lucky, there’ll be a pianist in the foyer which just adds to the timeless magic. There are several dining areas to choose from – the chandelier lit Restaurant, the sumptuous velvet Garden Room, two lounge rooms or below stairs in the Pantry where you can dine privately at the ‘Chef’s table’ while watching the kitchen at work. 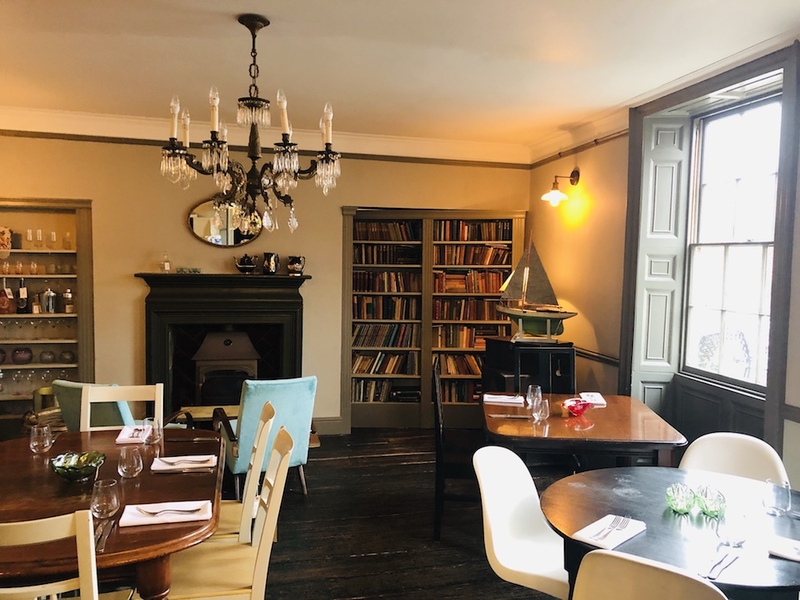 I was delighted to discover a secret dining room behind a book case which can be hired for small private functions and I’m already planning a little soirée for my birthday. The food was outstanding and I loved the healthy smoothie selection on the breakfast menu. I’d definitely recommend The Dial House for a romantic night away or a girly weekend. It has everything you need – all of the above plus spa treatments can be booked in your room, afternoon tea, cocktail bar, designer seconds boutique and if you fancy fine tuning your culinary skills there’s even a regular programme of cookery demos with Exec. Chef Andrew Jones and Head Chef Dan Herbert. There’s plenty to do in the area but we recommend a car. 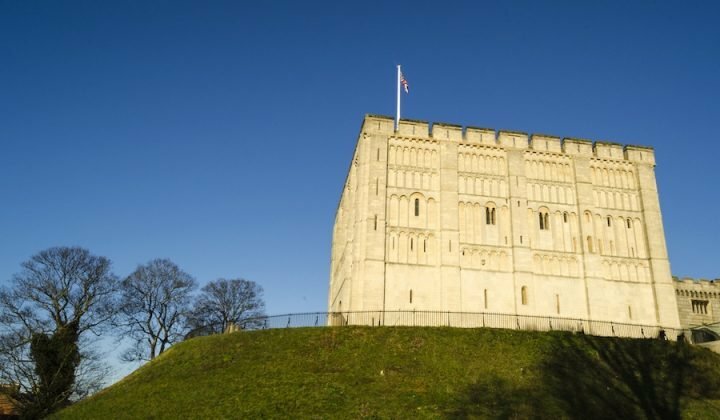 Norwich is approximately 30 minutes drive and has all the shops and night life you’d expect of a city – see our What’s On guides for things to do. The market town of Holt is about the same distance with some great independent art galleries and boutiques – check out Adrian Hill Fine Art. Surrounded by seven acres of countryside, the Fire Pit has everything you need to create a fun festival style getaway. 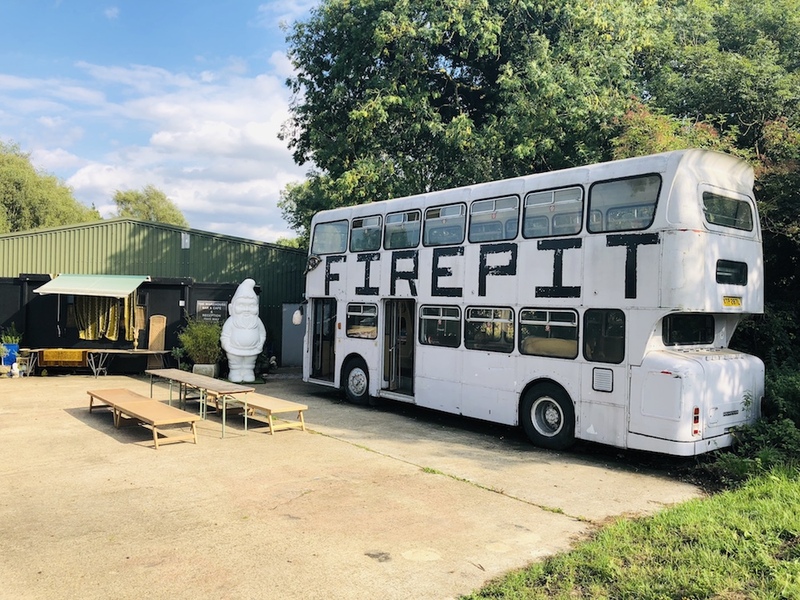 The Fire Pit is only available for private group hire – weddings (fully licensed), celebrations or corporate events and packages include six bell tents, furnished warehouse bar, Leila the Retro Double-Decker Bus and Priscilla the Vintage Mini Caravan. 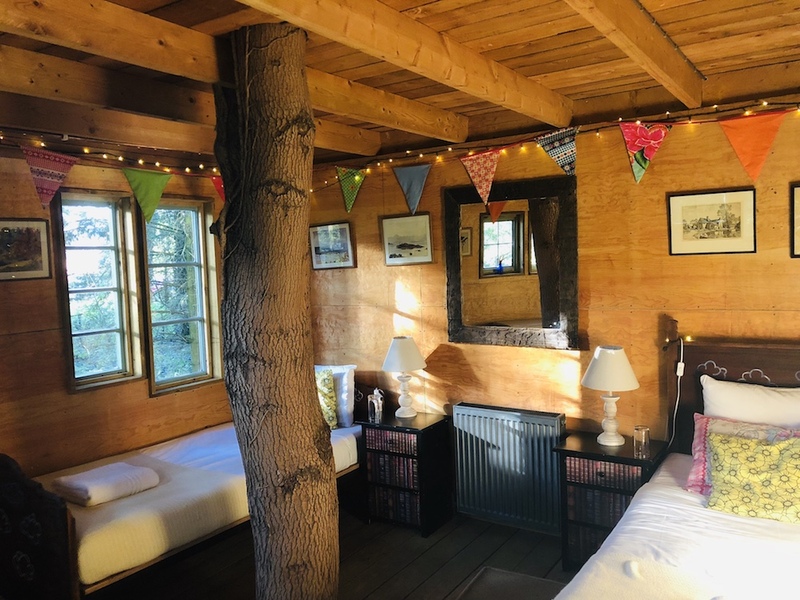 Plus pièce de résistance and our home for one night only – The Wren’s Nest! 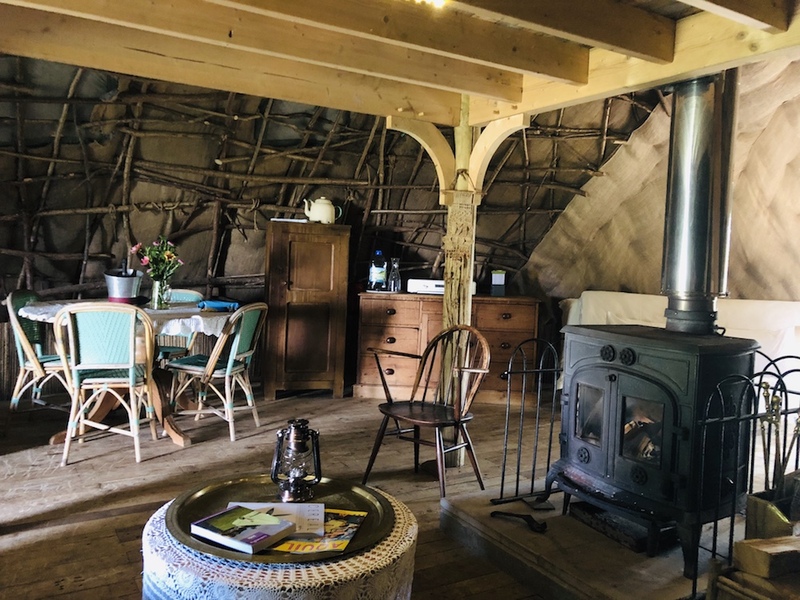 Well it’s a structure of hazel branches that are bent and woven to create an amazing dome-like structure and the Wren’s Nest in little ole Wendling is one of only two places in the world that you can hire. As you drive up, it’s rather unassuming – just a big green canvas mound. Step inside and ‘wow’ it’s exactly what I imagine The Shire in Lord of the Rings to look like. The craftsmanship is beautiful and just like a bird’s nest with lots of interlaced branches supporting the outside canvas. It sleeps six in two doubles and two single day beds and is completely open plan so very much communal living. Although if you’re quick you can bagsie the master bedroom on the central mezzanine which will give you a little bit of privacy. Small kitchen complete with crockery, dining room table and lounge area with a wood burner – this is simplicity at it’s best. I knocked up a delicious sausage and beans on the two ringed stove and with no running water inside the kids washed up in the communal outdoor kitchen and for once didn’t moan about it. 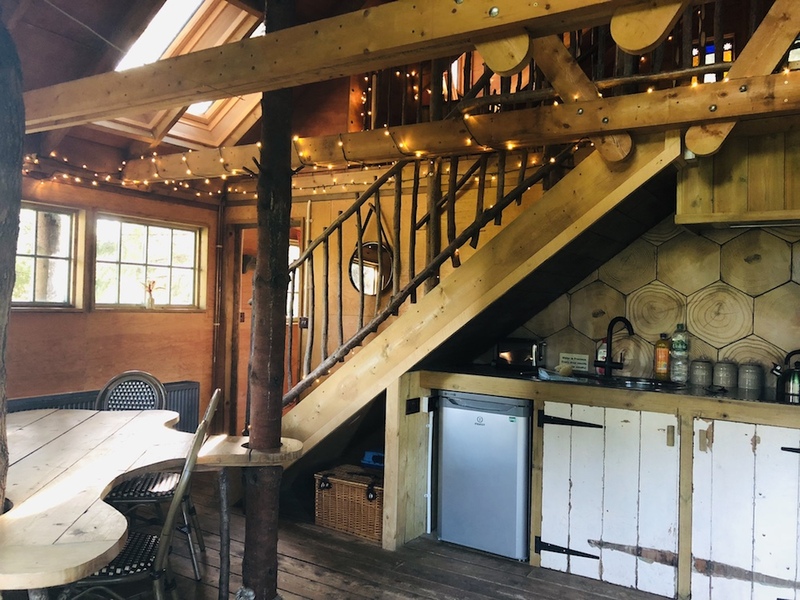 No electricity and just solar panels for the fairy lights – once the night draws in the nest feels incredibly magical. We sat by the wood burner and played games before retiring early to our cosy little areas for a peaceful nights sleep. I love a bit of vintage and so the guild mirrors, Chrystal decanters, wicker dress screens, velvet stool and macrame were not wasted on me! 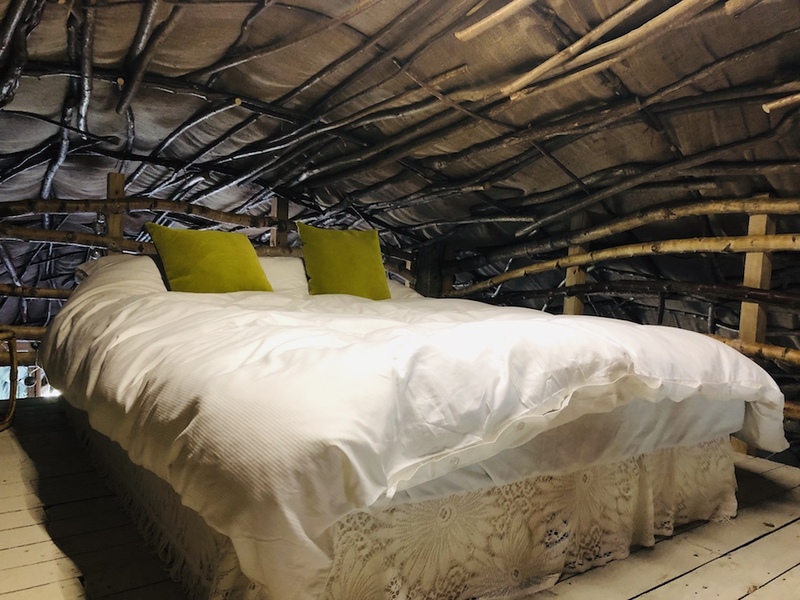 The Nest is just one part of this fabulously fun experience stay. 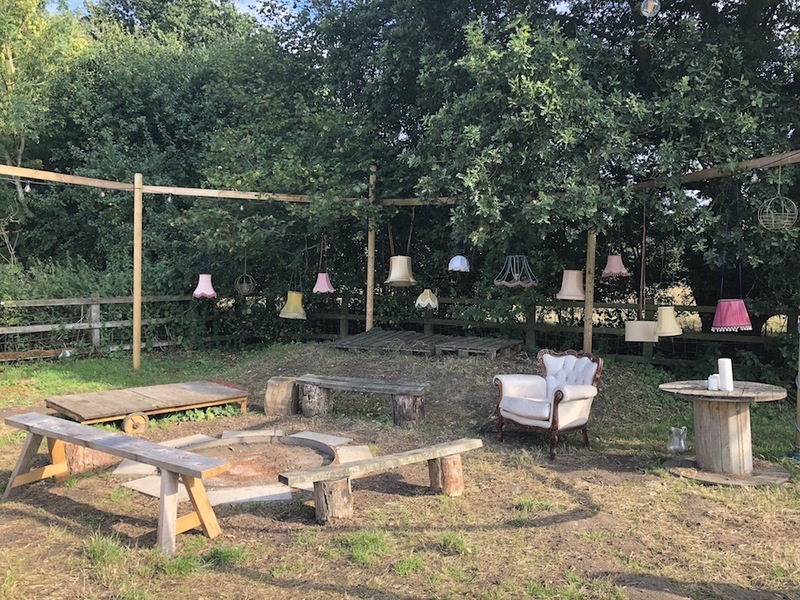 I loved the shabby chic relaxed vibe and could easily imagine being here with groups of friends sitting around the fire pit in the comfy armchairs with the retro lamp shades whilst hoards of kids run around playing in the fields and on the double decker bus. It’s a real nostalgia trip! 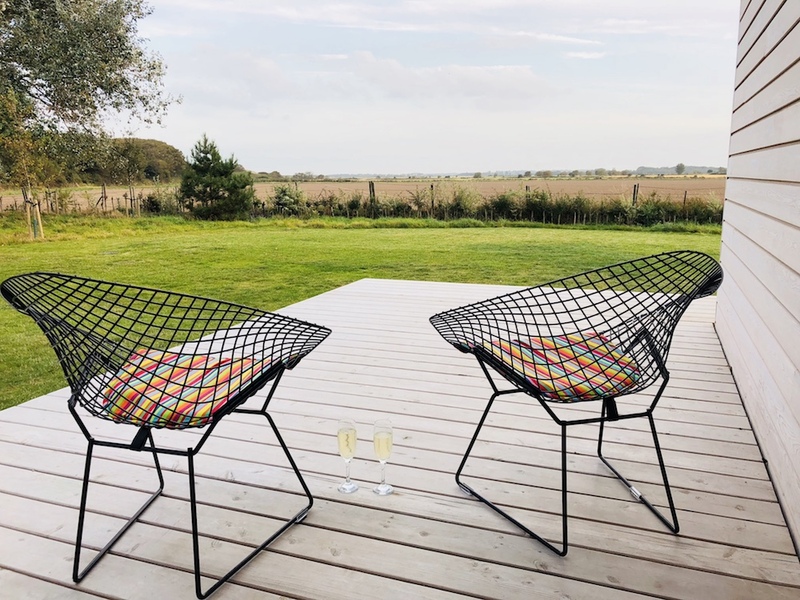 So there we have it – just a few of my favourite Norfolk stays. Please let us know if you stay at any – we love to hear your comments.